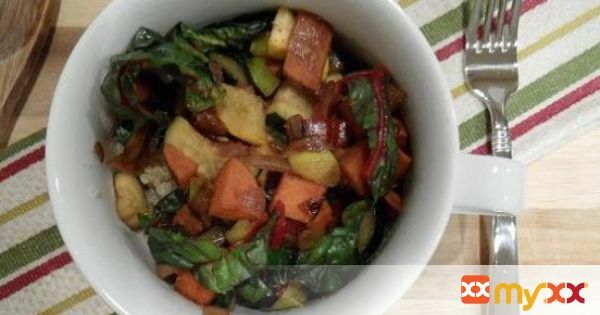 Zucchini and yellow squash, sweet potato and rainbow chard sauteed in red wine and worcestershire sauce, served with quinoa. LOADED with nutrients and great flavor! 1. In a medium saucepan, boil 2 cups of water for every one cup of quinoa you are making. Follow the directions on the back of your quinoa package. I bring water to a boil, add the quinoa, then simmer for about 20 – 25 minutes. 2. Clean all vegetables thoroughly. In a large skillet or wok, heat 1 teaspoon of olive oil. Add the sweet potato and chard stems. 3. Sauté about 5 minutes before adding the onion. 4. Continue to sauté – the vegetables should begin to sizzle and when they do, begin adding vegetable stock, about 1 tablespoon – just enough to boil and create steam. 5. Continue to add small amounts of vegetable stock and red wine when the liquid burns off and the sound of the sizzle dies down. After about 12 minutes of this, check the “done-ness” of the sweet potato…it should be al dente by now and not cooked all the way through. 6. Add the leek and sauté about 1 minute. Add salt and pepper to taste. 7. Add all of the squash. Pour in the last remaining vegetable stock and red wine (there should only be a little left, if any) and add about a tablespoon of Worcestershire. Saute an additional 4 to 5 minutes. 9. Serve a heaping portion of sautéed veggies on top of quinoa. Add salt and hot sauce to taste and enjoy your nutritious meal!